Heat oven to 350°F. Grease 9-inch pie plate with shortening or cooking spray. In medium bowl, stir all ingredients until blended. Pour into pie plate. Bake 50 to 55 minutes or until golden brown and knife inserted in the center comes out clean. Cover and refrigerate any remaining pie. Ever wonder why there is such a difference in the price among vanilla extracts? Pure vanilla extract gets its flavor from extracting real vanilla beans and is more expensive. Imitation vanilla, on the other hand, is created from various artificial flavorings and therefore less costly. Read coconut packages closely and you’ll notice that there are two types available: flaked and shredded. Flaked coconut is cut into small pieces and is drier than shredded coconut. Either type works well in most recipes, but using shredded results in a more moist and chewy finished product. This is one of our favorite back-of-the-box recipes, and yours too, it seems — more than 600 of you have positively reviewed this recipe. And really, it’s no wonder why. 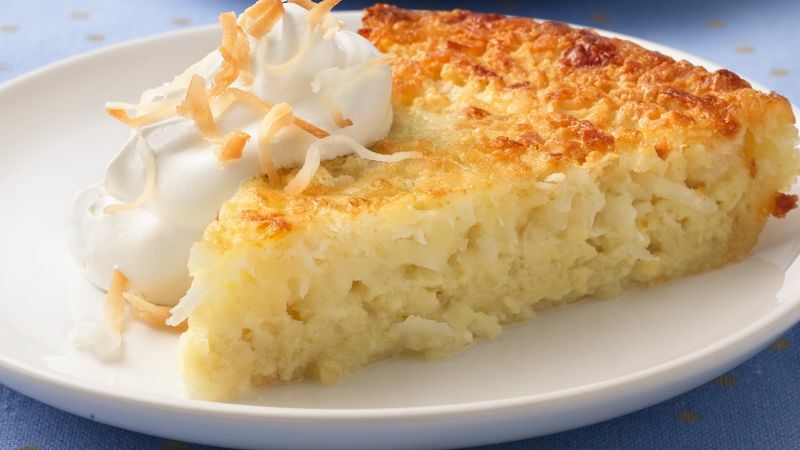 In just over an hour, you can bake up a chewy, sweet and moist dessert featuring all the tropical flavors that everyone loves in a traditional coconut pie. Make this no-stress dessert for your Easter feast or anytime really — it’s a guaranteed crowd-pleaser. You can use either flaked or shredded coconut — though we prefer the moist texture of shredded coconut. There’s really no trick to pulling off this recipe, it truly is impossibly easy. If you’d like more recipes like this, check out the rest of our impossibly easy recipes for both sweet dessert and savory dinner pies. Betty’s also got plenty more recipes for coconut lovers, whether you’re craving coconut cookies, coconut cake or even a sweet-and-spicy coconut curry!